Glass is an amorphous solid material, i.e., does not exhibit crystalline structure. It is translucent or transparent, brittle, rigid and hard. Due to the non-crystallinity, the term “glass” (glass) or “glassy” expanded meaning all amorphous solids. The transparency relates to visible light because ordinary glass is opaque to ultraviolet radiation. As the material is chemically and biologically inert, fully recyclable, and therefore, particularly suitable for use in manufacturing food and beverage packaging. The glass was prepared by fusion of quartz sand, which is the main component of the (former), one or more fluxes and one (or more stabilizers. If no stabilizer used, the glass becomes brittle and disintegrates in water. The prepared glass joint with quartz sand fusion (SiO2) (73,7%), sodium carbonate (common. Soda, Na2CO3)) (16%), potassium oxide (K2O) (0,5%) (fluxes) and calcium carbonate (common. limestone (CaCO3)) (5,2%) of magnesium carbonate (MgCO3) (3,6%) and aluminum oxide (Al2O3) (1%) (stabilizers). Depending on the type and amount of fluxes and stabilizers taken and the various types of glass. Glass, since prepared as raw material, can get the desired shape in three ways: either by blowing (blown glass) or with the help of molds or devices that create sheets (“blades”) glass. Solid high hardness (7 on a scale Mohs). Fragile. The fragments are oxylikta. Transparent for the spectrum of visible light. One of the biggest problems of modern cities is ychorypansi. Choosing the right pane can achieve soundproofing to the point that a child sleeping next to a plane with plirx power on. Energy glass has the ability to save energy, ie. Heating cost reduction in winter (oil, natural gas) and cooling cost reduction in summer (electricity). Choosing the right pane energy gineai under the climatic conditions of the place and location of the building. The fire protection glazing in buildings offer protection of human life, limiting the extent of damage to existing / property, protection of building construction and securing escape routes and access to firefighting teams, ensuring the unique ability of transparency. 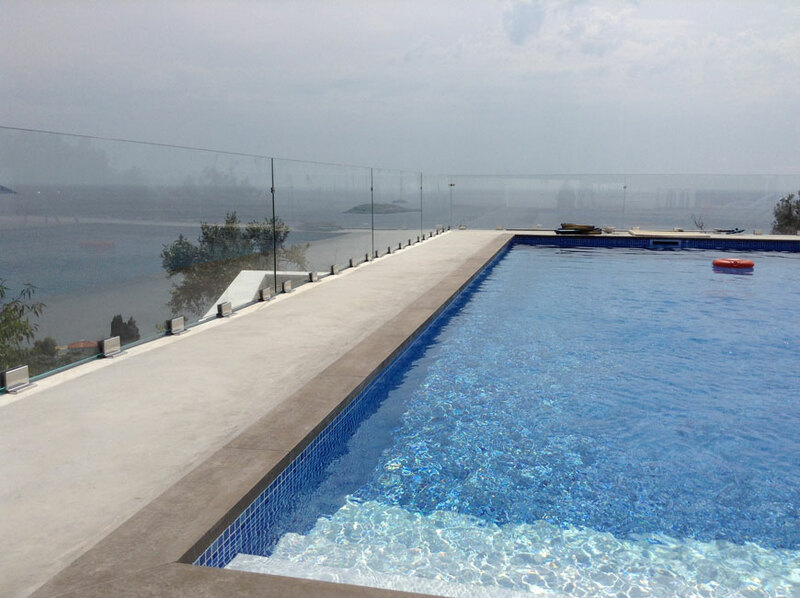 Glass balustrades and pool fences offer a luxurious and opulent appearance to a property, be it in a residential or commercial situation. Glass solutions have become increasingly popular. GOLEMAS can customise semi-frameless or frameless balustrades for your stairs, balconies, decks and pool areas. Maximum transparency and highest safety were goals during the development of the glass railings. The result is a widely pre-fabricated product which is safe and transparent. It is also fast and easy to assemble, therefore saves you time and money. Glass options are particularly appealing as they don’t interrupt the beauty of your view and provide an amalgamation of spaces. Οur aluminium framed glass balustrades are very popular with clients that want an unobtrusive balustrade solution which is also cost effective. Constructed using powder-coated aluminium, all balustrade components are available in a range of colours and have been designed to stand the test of time in harsh coastal conditions. Every component of our balustrade system has been tested to comply with relevant safety standards and installed to meet all European Standards. Glass pool fencing combines safety and beauty in a cost effective system that can transform your pool surrounds and complement any new development projects. As with all our products and services, installation complies with European Standards and regulations. And all these with the unique combination of quality, beauty and reliability, we offer to our customers for the last 50 years. Design your future with GOLEMAS!